We’d love your help. Let us know what’s wrong with this preview of Stardust Summer by Lauren Clark. Then, one thousand miles away, tragedy strikes. A massive heart attack leaves Grace’s estranged fath Single mom Grace Mason doesn’t believe in miracles, magic, or love at first sight. She likes the quiet life, complete with her eight-year-old son, their tiny house, and her teaching job. For Grace, happiness means that nothing much ever changes in Ocean Springs, Mississippi. To ask other readers questions about Stardust Summer, please sign up. Grace Mason is a single mother of an eight-year old son named Evan, who lives a quiet life in Ocean Springs, Mississippi, a thousand miles from her troubled childhood in Keuka Lake, on the Finger Lakes region of Upper New York State. When Grace receives the tragic news that her estranged father Henry has suffered a fatal heart attack, Grace and Evan travel to her hometown to attend the funeral. Planning on only staying nine days, Grace embarks on a journey that lasts the entire summer, a journey of self-discovery that will teach her about forgiveness, family dynamics, closure, love and second chances. It is a life lesson that she will learn from her stepmother Kathleen and their neighbor / town doctor, Ryan Gordon. Stardust Summer is a poignantly touching story of family relationships, forgiveness, love, and second chances. Author Lauren Clark weaves a heartwarming tale written in the third person narrative, set in the lovely Finger Lakes region in Upper New York State. It is a realistic story of the struggles within Grace's family relationship, and her ability to deal with the varying dynamics that come from this relationship: her troubled childhood with her estranged father Henry; dealing with his loss; making peace with the past; learning forgiveness and learning to believe in love and second chances. This is an emotional story that will have the reader feeling the full gamut of emotions, you can't help but get drawn in as Grace's story unfolds. The author provides an intriguing cast of characters who are realistic and have issues that are easy for the reader to relate to. I loved the development of the complexity in the relationships between Grace and her father Henry; Grace and her stepmother Kathleen, and between Grace and Ryan. I really enjoyed the mixture of tension and strife of the family dynamic, the suspense and drama, and the humor and lighthearted romance that ran throughout the storyline. I think what I loved most of all was the message that the author sends to her readers: the importance of family and being able to deal with life's challenges that come along with relationships. I loved the richly detailed description of the Finger Lake region of Upper New York State, I would love to visit that area and take in its beauty and charm. Stardust Summer is a wonderful story of family, love and lessons learned, it is a story that will touch your heart, and make you ponder your own relationships, it is a story that will resonate with you for a long time. Disclaimer: I received a copy of the book from the author / publisher in exchange for my honest review and participation in a virtual book tour event hosted by ABG Reads Book Tours. "Stardust Summer" is a story about redemption, dealing with grief, and family. There is also a little pinch of romance. Clark brings together some great characters in order to illustrate these things. I really liked the characters. Grace was probably my favorite character in the book. Her relationship with her father was fraught with issues after she loses her mother at a very young age. Grace can't really forgive her father and she doesn't have a real relationship with him. It was interesting t "Stardust Summer" is a story about redemption, dealing with grief, and family. There is also a little pinch of romance. Clark brings together some great characters in order to illustrate these things. I really liked the characters. Grace was probably my favorite character in the book. Her relationship with her father was fraught with issues after she loses her mother at a very young age. Grace can't really forgive her father and she doesn't have a real relationship with him. It was interesting to see how she deals with this relationship. I felt bad that she couldn't put the past behind her a little more so that her son, Evan, could have a real relationship with his grandfather. Luckily, Grace eventually realizes that sometimes it is much better to make peace with the past instead of holding on to old, unhealthy feelings. I also really liked the morphing of the relationship between Grace and Kathleen, her step-mother. They have a really interesting back story and it is easy to see why they do not really have a good relationship at the beginning of the book. I liked watching their relationship transform from something pretty bad to something deeper and more real and loving. I really wanted the relationship between Grace and Ryan to be explored a little bit more. I wanted to know more about their attraction to each other. Overall, the writing is fairly engaging. I did think that there was some details in the book that could have been tightened up a little. There was also a lot of telling rather than telling and reiteration where the reader could have definitely come to their own conclusions without more statements or words. Bottom line: A good family story! Love. Forgiveness. Parents. Children. Second chances. Life. Stardust Summer is about all of those things. It's about thinking that there will always be time to say good-bye, and then discovering that there isn't. It's about being playing it safe, because taking risks involves the risk that you might get hurt. And discovering that you get hurt anyway. Two women's lives are connected by one remarkable man. Henry Mason was lucky. He loved his first wife, and mourned her when she died. Then he fell in love with her best friend, and happily married her. His daughter Grace never forgave him for finding happiness with Kathleen. The woman she blamed for her mother's death. The woman she still blames, over a decade later. That blame kept her from visiting her father, kept him from having the relationship he could have had with her son, his grandson. Henry Mason is dead. At 57, of a sudden stroke. Grace can't go back. Only forward. Kathleen is lost. She needs Grace. She needs Evan, the only grandson she will ever have. Kathleen loves them both, but can't find a way to bridge the years, the resentments, the loss. She wants to. So very much. And next door, Ryan Gordon. Henry's doctor. Henry and Kathleen's friend. A man who came to upstate New York with the intention of building a practice and forgot to build a life. His wife left him. He wants a second chance. With Grace. But for there to be a future, Grace has to let go of the resentments in her past, and embrace the joys, and even the heartaches, in today. All in one summer that might just be filled with stardust. Escape Rating B+: Stardust Summer is a captivating story. It worked best for me when it focused on the stresses and strains of Grace's and Kathleen's relationship, because there was so much there to be worked through! Grace has been so closed off, and she really had a ton of stuff to deal with, not just with Kathleen but the why of what kept her away from her father and from his home in upstate New York. She had frozen herself and her career in a rut after her mother's death and a disastrous relationship. I think there could have been even more angst and it would have worked in the story. The love story between Ryan and Grace could have used a bit more heat, or it didn't need to be as prominent in the last third of the story. Ryan's regrets about the breakup of his marriage were portrayed well, and I liked the way his sincere grief over Henry was handled. He definitely needed to be involved with Kathleen and Evan, but the love story either needed to be a LOT more, or to remain as merely potential. I've often shared that spring is my favorite season, because I feel it's a time of renewal and fresh beginnings. It's also a perfect time to self reflect and look at what's going on in our personal lives. If we see relationships that need work, focus on them, and make the changes that are necessary. That's what I loved about Lauren Clark's new novel, STARDUST SUMMER. It spoke straight to my heart about family, forgiveness, resentments and falling in love again. From the moment I started reading I've often shared that spring is my favorite season, because I feel it's a time of renewal and fresh beginnings. It's also a perfect time to self reflect and look at what's going on in our personal lives. If we see relationships that need work, focus on them, and make the changes that are necessary. That's what I loved about Lauren Clark's new novel, STARDUST SUMMER. It spoke straight to my heart about family, forgiveness, resentments and falling in love again. From the moment I started reading her book I couldn't put it down. It spoke to situations in my own life and I'm sure I won't be alone. Grace Mason is a single mother living a quiet life with her eight year old son, Evan in Ocean Spring, Mississippi. The father of her son is a distant memory. She lives in a small house, has a teaching job, her mother is dead and she is estranged from her father, Henry who lives on a lake house in upstate New York. She gets word from her step-mother, Kathleen that Henry has suffered a massive heart attack, after not being in contact with him for years. By the time Grace and Evan make it to New York, Henry has passed. There's a funeral and several days for the three of them to get to know one another, sort of. That's when they realize how much they don't, but how much they need each other. Kathleen's neighbor, Dr. Ryan Gordon, is divorced and attracted to Grace and Evan looks up to him. Ryan has been helping out the Masons for years and knows all about Grace and Evan. Having a lake house is a great buffer for serious discussions and clearing up misunderstandings. "The water is therapeutic. My dad always said there was something magic about this lake. Something in the stardust, especially when it's summer," Grace tilted her head back looking at the moon hanging low over the water. "Maybe he was right"
You know where this is going. But, who is going to give in first. It's Lauren Clark's beautiful writing that doesn't let it turn into cliche. "She thought about the words, 'I gave forgiveness I'd been denying.' That could have been written for me." Stardust Summer is a book that is packed with emotion. Grace is estranged from her father and hasn't seen him in years, despite his efforts to bridge the gap between them. I have to admit that Grace was tough for me to like at first. I wasn't completely sold on the reason for their estrangement, and when she goes to New York for the funeral and then stays for a while, there were times I felt she was being selfish and occasionally deliberately cruel. This is definitely a book where the main chara Stardust Summer is a book that is packed with emotion. Grace is estranged from her father and hasn't seen him in years, despite his efforts to bridge the gap between them. I have to admit that Grace was tough for me to like at first. I wasn't completely sold on the reason for their estrangement, and when she goes to New York for the funeral and then stays for a while, there were times I felt she was being selfish and occasionally deliberately cruel. This is definitely a book where the main character does some growing and changing before the end, in order to be a person you can admire and enjoy. Her stepmother, Kathleen, was a great lady. She's struggling horribly with her husband's death. One moment they were planning their retirement and then next she's having to face her later years alone, without the man she loved. And even though Henry has passed, his memory touches every page of this book in some way. I loved the man he seemed to be and, while he certainly wasn't perfect, I think that's one of the reasons Grace's behavior was so frustrating for me. Ryan, Grace's romantic interest and Kathleen and Henry's neighbor and doctor, is also a good guy. He has baggage from his failed first marriage to be sure, and some doubts about whether it was his fault (did he overlook something? Misdiagnose? Ignore symptoms?) that Henry died. But he has a heart of gold, and the patience of Job. This is another win for Lauren Clark. What I love about this author is that I know she's going to strum my heartstrings and make me swoon over a sweet budding romance. If you're looking for a beach read that will make you wax nostalgic about your childhood summers by the lake, download this book immediately! I got swept away by the gorgeous upstate New York setting. The descriptions of watercolor sunsets amid the Catskill Mountains, the sweet-smelling woods, the outdoor picnics - it all just make This is another win for Lauren Clark. What I love about this author is that I know she's going to strum my heartstrings and make me swoon over a sweet budding romance. If you're looking for a beach read that will make you wax nostalgic about your childhood summers by the lake, download this book immediately! I got swept away by the gorgeous upstate New York setting. The descriptions of watercolor sunsets amid the Catskill Mountains, the sweet-smelling woods, the outdoor picnics - it all just makes me want to pack up my Hello Kitty suitcase and head out to the Adirondacks. As for the characters, I really felt a connection with Grace. Throughout her journey, she's forced to go outside her comfort zone and come to terms with some serious resentment issues. Considering that families like the Waltons and the Bradies are an urban myth, I think a lot of readers will relate with her problems. I certainly did! You can find the full review at Chick Lit Café! 3.75 may be more accurate. Grace is the only daughter of Henry Mason and she misses him, but not enough to put her pride behind her and forgive her stepmother. Not even when she receives an invitation to attend the dedication of the new library on Keuka College campus named after her father. She just can't let the past go. Why should she? Until that fateful phone call, "Your father has suffered a stroke and he may not make it." Grace finally packs herself and her eight-year-old son up and heads 3.75 may be more accurate. Grace is the only daughter of Henry Mason and she misses him, but not enough to put her pride behind her and forgive her stepmother. Not even when she receives an invitation to attend the dedication of the new library on Keuka College campus named after her father. She just can't let the past go. Why should she? Until that fateful phone call, "Your father has suffered a stroke and he may not make it." Grace finally packs herself and her eight-year-old son up and heads to Penn Yan, NY. Will she be too late? Can she find forgiveness in her heart? Can she let go of the past? Most importantly, can she let go of her pride? Stardust Summer by Lauren Clark finds us back in two worlds, much like Dancing Naked in Dixie. Plunged between the simple deep south and upstate New York, Grace Mason, a single mom doing her best to raise her elementary age son Evan, receives shocking news that all starts with a brown box on the front porch that, "could have been missed all together" in the Mississippi heat. Then again, as the story unfolds, if "you wanted to take a broad view of the thing..." (Lee 3, To Kill a Mockingbird) it r Stardust Summer by Lauren Clark finds us back in two worlds, much like Dancing Naked in Dixie. Plunged between the simple deep south and upstate New York, Grace Mason, a single mom doing her best to raise her elementary age son Evan, receives shocking news that all starts with a brown box on the front porch that, "could have been missed all together" in the Mississippi heat. Then again, as the story unfolds, if "you wanted to take a broad view of the thing..." (Lee 3, To Kill a Mockingbird) it really all started when Grace was a little girl and her father was her whole world. From the beginning, the reader is immersed in the difficult adult relationship between Grace and her father. But, as fate takes a turn for the worse, the brown box on the porch means more than Grace will ever realize, because it turns out the be a shove off an emotional mountain for Grace, Evan, Kathleen (her father's 2nd wife and step-mother), and the handsome next door neighbor, Ryan (who just happens to be the town doc). While Grace thought life in Mississippi was what she needed, a pull to survey her surroundings at the hand of her father (you'll see) allows to view upstate New York in a new way. But the punches keep coming for both Grace and Kathleen. These two women spend their time wrapped up in a very difficult duet making choices to save their own sanity and protect those they love. Happy endings are always a pleasing outcome, but the hardships endured to get there should never be forgotten. Stardust Summer was a quick read for me, finished in two days. The plot moves forward aggressively and I appreciated the dynamics between the characters. But, no matter how hard I tried, I could not like Grace, who serves as the protagonist of the novel. Her childish behavior irked me constantly, but that may not be the case for all readers. I find weak and whiny women often force me to seek fascination with another character. In this, Clark did not disappoint me. I adored Kathleen and loved Ryan. The young boy, Evan, reminded me a lot of my own son and I can admit that during a particular struggle involving him, I did feel a pang of emotion for Grace, from one mother to another. I think this book has potential, and it certainly satisfies the romance reader cheering for the girl to start all over again. I see a trend in Clark's book, well at least between Dancing Naked in Dixie and Stardust Summer: a struggle of relationship between fathers and daughters. I found this hard to connect to myself, but I know it's a problem for a lot of women out there. Clark's writing might be a soothing balm to those dealing with this particular conflict. Overall I'd give this a 3.5 out of 5 stars. The plot was forward moving and the characters developed well, but a few of the events were contrived for me and I knew the ending long before I got there. With that said, I'd read another novel by her as there is always the element of Southern charm weaved within the pages. Lauren Clark is an author I very much enjoy. I really enjoyed her debut novel, Stay Tuned, and I absolutely adored Dancing Naked In Dixie when I read it last year. So I was really chuffed to see Lauren’s third novel was finally being released. It wasn’t Pie Girls, which was meant to be Lauren’s third novel but which is delayed until later on this year (yay), instead her new release is Stardust Summer, and although I didn’t enjoy it as much as Dancing Naked In Dixie, it is still a novel that I’d Lauren Clark is an author I very much enjoy. I really enjoyed her debut novel, Stay Tuned, and I absolutely adored Dancing Naked In Dixie when I read it last year. So I was really chuffed to see Lauren’s third novel was finally being released. 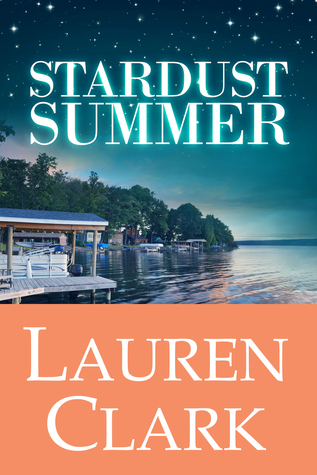 It wasn’t Pie Girls, which was meant to be Lauren’s third novel but which is delayed until later on this year (yay), instead her new release is Stardust Summer, and although I didn’t enjoy it as much as Dancing Naked In Dixie, it is still a novel that I’d recommend. When Grace Mason’s father dies, she finds herself leaving her Mississippi home and heading to New York for his funeral with her son, Evan. Grace and her father, along with his wife Kathleen, haven’t had the best of relationships but she’s devastated to not have been able to say a final goodbye. Grace only plans to stay in New York for a short time, but she ends up staying the entire summer after spending more time with her step-mother and although she’s not entirely able to forgive Kathleen, she understands that Kathleen now feels lost without her husband and Grace and Kathleen’s next-door-neighbour Ryan, a doctor, try to help Kathleen move forward. When the time comes for Grace to head home again, will she be able to pull herself away from New York and its beautiful lakes? I really liked the plot of Stardust Summer, I liked the fact that it delved into Grace’s past and I spent a lot of time wondering just what Kathleen and Grace’s father Henry had done to make their relationship so strained. If I’m being honest, Grace’s anger was a bit unfair. When all was said and done, I felt she’d treated Kathleen a bit meanly, and I was sort of hoping for them to have a one-to-one to properly air their grievances, or, rather, for Grace to air her grievances as it was Grace with the issues. A lot happens in the novel – think of every bad thing that could happen to multiple people and they all happened to Grace and Kathleen during Grace’s stay. At times, it was a bit much for one family to cope with but I admired how Grace and Kathleen coped. And her voice lifted, loud and clear. Kathleen sang, off-key, but strong. “And now the purple dusk of twilight time steals across the meadows of my heart. High up in the sky the little stars climb, always reminding me that we're apart." Evan scrunched his nose. “Oh. People do weird things when they're in love, then." He sunk back against the gray plush of the seat. “Look at you. You’re here,” Kathleen was able to gasp. She hugged Evan again. "I'm so happy. Ryan and Grace laughed as Kathleen released him. "Phew!" Evan exclaimed, stretching his arms above his head. "I can take deep breath now." This is not my typical style of book I like to read but when I started to read it I realized that it was the beginning of a great story. Throughout the book you go through the being part of Grace’s life and what to get to know her better. Grace has a son named Evan and she has been through heartache everyone she loves leaves her so she believes that if she closes her heart of to love then she cannot be heart. She is a woman who builds her life around her son and a career as a teacher is set in such a way that she can be with him as much as possible. Then she receives news that her father that she has been estranged from has had a massive heartache and is dying. She and her son do the right thing and go to say their goodbyes. At first it was supposed to be a trip to say goodbye and go back home but something drew her to this town and now she decides to spend the summer. Throughout this book you learn more about her, her step-mother Kathleen and the doctor Ryan. Grace and Ryan have are becoming close but can they trust their feelings? Can they trust each other? Will Grace let her fears of being left if she lets herself love him ruin what they have? This is a must read story. This was a great story about realizing the importance of family, believing in love and starting over. Grace Mason lived her life for her son, remembering that fairy tales don't happen. She keep a small house in the town in Ocean Springs, Mississippi and works as a teacher's aide so she could be there for her son. But when her estranged father falls ill, Grace finds herself rushing to the small town he lives in off Keuka Lake. She thought she would be there for a few days and return to her orderly This was a great story about realizing the importance of family, believing in love and starting over. Grace Mason lived her life for her son, remembering that fairy tales don't happen. She keep a small house in the town in Ocean Springs, Mississippi and works as a teacher's aide so she could be there for her son. But when her estranged father falls ill, Grace finds herself rushing to the small town he lives in off Keuka Lake. She thought she would be there for a few days and return to her orderly life. She didn't realize that everything was about to change. I loved Grace. She was one of those characters that you just hope she'd find a way to let go of the hurt and anger she's held on to for so long and find her happy. She was this amazingly strong woman who raised a son on her own and did it without her family close by because of the rift between herself and her father and step-mother. It was sad to think that when she finally understood why her father moved and worked on her relationship with her step-mother so many years had passed. But she was a woman who wasn't afraid to admit when she was wrong and she did it. Not only with her step-mother, Kathleen, but also with the only man who has sparked any romantic interest for her in years, Ryan. Ryan was another character that I loved. He was a workaholic that didn't know who to let go of the hurt and anger over his marriage falling apart. It wasn't until Grace appeared next door that Ryan started feeling again. He was quirky, funny and exactly what Grace needed. My only wish was for their slow growing romance was to have it develop more on the page. It seemed like all of a sudden it was so clear what they meant to each other, without having actually gone through their courtship. When I read Lauren's other novels, I liked them but wasn't in love with them. I was wondering how I'd feel about her latest but Stardust Summer surprised me in the best possible way. I was also surprised when Lauren told me, via email, that she had actually written this book several years ago and had put off publishing it. I have no idea why. It was so good. I was so invested in the characters in this novel. I was immensely sad that Grace and her father were not able to make up before he passed a When I read Lauren's other novels, I liked them but wasn't in love with them. I was wondering how I'd feel about her latest but Stardust Summer surprised me in the best possible way. I was also surprised when Lauren told me, via email, that she had actually written this book several years ago and had put off publishing it. I have no idea why. It was so good. I do think that Kathleen went through way too much. There were just one too many incidents and I found myself thinking "How much more can this woman take?" I didn't like the last accident, even if it was the reason Grace went back. (How's that for vague and confusing?) That last accident also felt a little disjointed from the overall tone of the novel. But this was really the only thing that didn't sit well with me from this whole book. Grace was standoffish and almost rude but I was never frustrated with her. I knew there had to be a good reason for how she was acting, I just had to wait for the explanation I knew Clark would give me. Sure enough, I found her actions justified once I was "told" her full story. I really enjoyed the romance in the novel. It played a large role but was understated, it didn't take over the novel. Ryan really understood Grace and seemed to know how to deal with her issues and lack of communication. He was patient and waited while she figured out her feelings. It was sweet and I found myself hoping for a happily ever after. Stardust Summer is a moving story set in a small town on Keuka Lake, in Upper New York State. It’s a story of loss, resentment, forgiveness and love. When Grace Mason learns of her father’s death she finds herself and her son, Evan, traveling to a place she never wanted to be, and spending time with a person she never wanted to be see again. Nine days...she could handle nine day, couldn’t she? While there, Grace is forced to face her resentment and anger, and deal with her loss. She might even le Stardust Summer is a moving story set in a small town on Keuka Lake, in Upper New York State. It’s a story of loss, resentment, forgiveness and love. When Grace Mason learns of her father’s death she finds herself and her son, Evan, traveling to a place she never wanted to be, and spending time with a person she never wanted to be see again. Nine days...she could handle nine day, couldn’t she? While there, Grace is forced to face her resentment and anger, and deal with her loss. She might even learn to love again. Grace's step-mother, Kathleen Mason loved her husband very much and can’t image going on without him. She does some pretty bizarre things after his death. I don’t think it is usual for people to behave strangely when dealing with a sudden loss. Kathleen’s emotions felt realistic to me. The tension between Kathleen and Grace is pronounced. They have a lot of unresolved issues to deal with. We know something has happened to drive a wedge between them, but it takes a while to find out what those issues are. Then there is the hot doctor next door to add to the many feelings Grace is dealing with. Ryan was not only Henry’s doctor, but also a good friend to both Kathleen and Henry. He spends a lot of time with Grace, Evan and Kathleen. There is definitely some chemistry between Ryan and Grace. I found the first part of the book to have a melancholy feel, which is understandable with Henry’s death and the reflecting both Grace and Kathleen are doing. There are some humors scenes also, for example, when Kathleen has the outside of the house painted an unusual color! And some suspenseful moments as a storm would come up suddenly on the lake. I could really relate to Grace's feelings toward Kathleen. I’ve had some of those same feelings toward my step-mother. The picturesque descriptions of the lake and countryside are beautiful! Stardust Summer is a lovely story of finding forgiveness and love again! What worked: After reading Dancing Naked in Dixie, I knew I just had to get my hands on Lauren's newest release, Stardust Summer. If there's one thing that this author excels at, it's well-rounded characters. That's a winner in my book! On one hand, we have Grace Mason who tries to plough through life on her own because if she doesn't rely on someone then they can't let her down. On the other, we have Ryan Gordon who is too wrapped up in his work as a doctor. He likes to focus on other people's problems and try to fix them instead of dealing with his own.Two very different characters that ultimately need each other to learn and grow as individuals. Stardust Summer is very much about the different ways we deal with grief. Do we pretend it never happened? Do we hold on and go on a trail of self-destruction? Or do we accept that it's a part of life and try to deal with it. I really liked that Lauren dealt with this in such a frank way because everyone grieves differently and yes, there may have been a few over-dramatic moments but grief is dramatic. hat irked: Stardust Summer is quite dark and I would have liked to see more happy, light-hearted scenes because toward the end it did feel a bit gloomy. I wanted to see a bit more of Lauren Clark's humour but I realise this is not meant to be a funny book. Once or twice, Ryan did try to bulldoze in to a couple of situations that didn't concern him but I was glad that Grace told him it wasn't really his place to say anything. It still annoyed me a little because interfering characters that need to take a step back do get on my nerves. Grace has no intention of going to see her father and step-mother when she receives a formal invitation to a library function at the college where her father works. They’ve been estranged for a long time and she’s just fine with her quiet life in Mississippi. Her plans change when her father has a heart attack. She and her son Evan hurry to New York hoping to arrive before it’s too late. Their plan is to stay for a week or so but their visit becomes much longer for various reasons. In that time Grace has no intention of going to see her father and step-mother when she receives a formal invitation to a library function at the college where her father works. They’ve been estranged for a long time and she’s just fine with her quiet life in Mississippi. Her plans change when her father has a heart attack. She and her son Evan hurry to New York hoping to arrive before it’s too late. Their plan is to stay for a week or so but their visit becomes much longer for various reasons. In that time Grace will discover information about her past that could change the way she views her future. Will she be able to change her feelings with the new information? And is she willing to make a fresh start? I loved this book from the very first word. Grace is raising her son alone because his dad ran as soon as he found out there was going to be a baby. (JERK) Grace and Evan are very close and he is a sweet little boy. He wants to go and visit his papa when he gets the invite to come visit for the summer but Grace can't let go of the past. Her mom was killed by a drunk driver when she was just a teen and when her dad remarried and moved away she blamed her stepmom, Kathleen, for taking her dad away. I loved this book from the very first word. Grace is raising her son alone because his dad ran as soon as he found out there was going to be a baby. (JERK) Grace and Evan are very close and he is a sweet little boy. He wants to go and visit his papa when he gets the invite to come visit for the summer but Grace can't let go of the past. Her mom was killed by a drunk driver when she was just a teen and when her dad remarried and moved away she blamed her stepmom, Kathleen, for taking her dad away. She does end up having to go though when her dad dies of a massive heart attack(made me cry) and face Kathleen. Neither one of them wanted to be the first to start a much needed conversation though so nothing was settled between them. The good looking Dr Ryan who has been friends with Henry(Grace's dad) and Kathleen for years lives next door and is really taken with Grace. But both are afraid to give in to their feelings. He was burned by his wife, even though part was his fault. Just because he worked too hard though. The day that Grace and Even leave to go home while seated on the plane Grace has a feeling that she needs to stay. To try and find the family that she needs and that need her too. Can't say anymore without giving too much away. But it just gets better and better from start to finish. It is another book that I hated to see come to an end. I enjoyed this book so much and felt like I was there. It kept me wanting more and wanting to know more. Stardust Summer is a wonderful read and Lauren Clark did a great job. I had to give this book 5 stars and it really deserved more. Wonderful story that will make you stop and think where family are concerned. Don't wait until it is too late to let people know how much they mean to you. I love all of Lauren's books but I think this one is my favorite so far. Great job and thanks so much for writing this. STARDUST SUMMER begins at the end of one love story and at the start of another. Grace Mason adores her son, Evan. She's built her life around him, even her career as a teacher has been carefully selected to ensure she can spend as much time with him as possible in their small hometown of Ocean Springs, Mississippi. She's happy, content even, but a tragic twist in her otherwise simple life will send Grace (with Evan in tow) to the Finger Lakes region of New York state to face old resentments and STARDUST SUMMER begins at the end of one love story and at the start of another. Grace Mason adores her son, Evan. She's built her life around him, even her career as a teacher has been carefully selected to ensure she can spend as much time with him as possible in their small hometown of Ocean Springs, Mississippi. She's happy, content even, but a tragic twist in her otherwise simple life will send Grace (with Evan in tow) to the Finger Lakes region of New York state to face old resentments and maybe find a way to put the past behind her. Ryan Gordon knows something about loss. His marriage has failed and it's the sort of devastation he hasn't come to terms with yet. His position as a small town doctor has left him overworked and now, to share the burden of the tragedy that draws Grace to his town. He never imagined that in the middle of those two blows he'd find a new start...but life is sometimes surprising. I stumbled across this novel Stardust Summer by Lauren Clark recently. Now is the perfect time to share it. This novel is on my Beach Read list of 2015. I hope it will also be on yours! Grace and Evan make their home in Mississippi, but her father and step mother live in New York. She receives an invite to a dedication of a library at her father’s university where he is the president. She is not about to go and forget the past. Then the unthinkable happens her father dies and Grace must I stumbled across this novel Stardust Summer by Lauren Clark recently. Now is the perfect time to share it. This novel is on my Beach Read list of 2015. I hope it will also be on yours! Grace and Evan make their home in Mississippi, but her father and step mother live in New York. She receives an invite to a dedication of a library at her father’s university where he is the president. She is not about to go and forget the past. Then the unthinkable happens her father dies and Grace must make the trip after all to New York to deal both the death of her father and her relationship stepmother. Then there is Doctor Ryan who lets work become his life, but has a special relationship with both of Grace’s parents. Will Grace discover healing with her family and be able to let go of the past? Will Ryan be able to look beyond his work? Lauren Clark is a favorite author of mine. I very much enjoyed this novel. The symbolism used to propel the story forward with the use of Grace’s name and the discussion of forgiveness. What does grace truly mean? How could it apply to the character Grace being open to a new future? She really let the characters tell their stories in this novel which added depth and made the plot interesting. This novel is an easy read which will keep you flipping the pages to the end. First off, let me say that I think Lauren Clark is an awesome person and I love her books. She is such a gracious author who really shows her appreciation of her readers. She is just so nice! There is no better way to describe her. I have never met her but feel like we could be friends. I read her book, Dancing Naked in Dixie, awhile ago and loved it. My thoughts are here. When I saw that this book of hers, Stardust Summer, was going on tour I jumped at the chance to be a part of it. This was anot First off, let me say that I think Lauren Clark is an awesome person and I love her books. She is such a gracious author who really shows her appreciation of her readers. She is just so nice! There is no better way to describe her. I have never met her but feel like we could be friends. This was another very enjoyable read and I loved the setting, a small community with a house on a lake. Doesn't that sounds lovely? Grace and her son have to go back to Grace's hometown when her father dies unexpectedly. Grace just wants to go there, bury her father and get out of town. But can things every be that simple? Does Grace really have the life she wants in Mississippi? Often family dramas like Stardust Summer can be heavy on sentimentality, making any connection to the characters or the plot difficult, However, Lauren Clarke is able to bypass this with the creation of Henry. Although the reader never 'meets' him, he is our link between the two groups of characters; Grace and Evan, Kathleen and Ryan, and we are constantly reminded in any given situation what Henry would think, or say, or do. Stardust Summer is still an emotional story, as those Henry has left be Often family dramas like Stardust Summer can be heavy on sentimentality, making any connection to the characters or the plot difficult, However, Lauren Clarke is able to bypass this with the creation of Henry. Although the reader never 'meets' him, he is our link between the two groups of characters; Grace and Evan, Kathleen and Ryan, and we are constantly reminded in any given situation what Henry would think, or say, or do. Stardust Summer is still an emotional story, as those Henry has left behind grieve for him in their own (sometimes unexpected) ways, and Grace confronts her own issues with Kathleeen. I would have liked to have seen the conversation between the two of them which Grace was promising and the final reconciliation, but I think Lauren Clarke delivered this in different ways. The romance between Ryan and Grace was expected but at times I think their flirting helped to break the tension of emotional moments. However, I think Lauren Clarke times their becoming a couple perfectly! Grace Mason chose a life as a single parent, leaving New York and finding her own way for herself Estranged from her father, Grace rebuffs his effort to get Grace and her young son home. When a distraught call comes with the news her father has suffered a heart attack, any chance Grace has to make amends are sadly shortly lived. Grappling with the death of her father, Grace ends up staying for the summer. With a tumultuous relationship with her fathers second wife, Grace finds herself taking a de Grace Mason chose a life as a single parent, leaving New York and finding her own way for herself Estranged from her father, Grace rebuffs his effort to get Grace and her young son home. When a distraught call comes with the news her father has suffered a heart attack, any chance Grace has to make amends are sadly shortly lived. Grappling with the death of her father, Grace ends up staying for the summer. With a tumultuous relationship with her fathers second wife, Grace finds herself taking a deep look within and wondering if it is time to forgive and start anew. Grace forms an attachment to next door neighbor Dr. Ryan Gordon, though both Ryan and Grace are gunshy and have their own reasons to be wary of a new relationship. Perhaps taking a risk and trusting one another is what both have been desperately looking for? Wow! This was not my normal type of read, but I could not put it down. I really enjoyed this book. The intricacies of families was so well written, estrangement, disappointment, poor communication, pride, death, hope, love; all rolled into about 10 days worth of story. This was a story about second chances and willingness to put pride aside to reconnect with family. Grace is forced to examine her approach to her father and stepmother. She had to be brave and rediscover having fun and letting peo Wow! This was not my normal type of read, but I could not put it down. I really enjoyed this book. The intricacies of families was so well written, estrangement, disappointment, poor communication, pride, death, hope, love; all rolled into about 10 days worth of story. This was a story about second chances and willingness to put pride aside to reconnect with family. Grace is forced to examine her approach to her father and stepmother. She had to be brave and rediscover having fun and letting people into her life and heart. Kathleen, her stepmother, had to learn to go on with her life. Ryan found his second chance at love and family while helping Grace find it too. The twists and turns were written with grace and tenderness. This is the first book by Lauren Clarke that I have read. I love the way she creates her characters and pulls you into their lives- you feel like they are your friends right away. I just loved Stardust Summer. I had a few tears happy ones and sad ones. Grace lives in Mississippi with her son Evan. Her Dad in New York. Grace hasn’t seen her Dad in years and then all of the sudden he dies. She and her son travel to the funeral and plan on spending 9 days with her stepmother Kathleen. Once she is there she meets Dr. Ryan Gordon, her Dad’s doctor who happens to live next door. The first meeting was at the house after the funeral when Ryan spilled punch on Grace – not a very go I just loved Stardust Summer. I had a few tears happy ones and sad ones. I found `Stardust Summer' to be a perfect blend of grief, relationships (family and personal), redemption and forgiveness. With a splash of love - though not too much. The cover is a little misleading and initially I thought I might be reading a chick-lit love story, but as I got further into the book I realised that this is a layered and complex tale. Parts of it were very raw in the sense that the emotions felt real and the character behaviours were relatable. Grace was an excellent character, I found `Stardust Summer' to be a perfect blend of grief, relationships (family and personal), redemption and forgiveness. With a splash of love - though not too much. The cover is a little misleading and initially I thought I might be reading a chick-lit love story, but as I got further into the book I realised that this is a layered and complex tale. Parts of it were very raw in the sense that the emotions felt real and the character behaviours were relatable. Grace was an excellent character, and the darkness and despair she suffered at times leaked through onto the pages. This is a book that put me firmly in mind of Marian Keyes, and her quirky novels. It was okay. It read a bit like a Lifetime movie, and I had a hard time getting into it or really wanting to finish it, but a friend insisted I read it, and since she read the last book I recommended to her, I felt it was only fair. It was really cool to read about local places (always nice to see The Finger Lakes getting some love in literature!) but I don't think I'd recommend it to anyone else. Unless they really loved Lifetime movies. Then they'd probably love this. Do you love Lifetime? The It was okay. It read a bit like a Lifetime movie, and I had a hard time getting into it or really wanting to finish it, but a friend insisted I read it, and since she read the last book I recommended to her, I felt it was only fair. It was really cool to read about local places (always nice to see The Finger Lakes getting some love in literature!) but I don't think I'd recommend it to anyone else. Unless they really loved Lifetime movies. Then they'd probably love this. What can I say other than Lauren has written another one that I absolutely adored! Very rarely can I say I have enjoyed every book I have read by an author. Stardust Summer is a story that will have you run the gambit of your emotions. Add it to your "must reads" today! Lauren's writing makes you become friends with Grace and you want the best for her and her family. Another winner from Lauren Clark. Set in the beautiful Finger Lakes region of New York State, the book covers the often complicated ways our relationships with our parents can play out. As always her characters are thoughtfully developed, and you finish the book craving more. This was a great book about forgiveness, growth, and family. I enjoyed reading this book and would recommend this author to anyone.